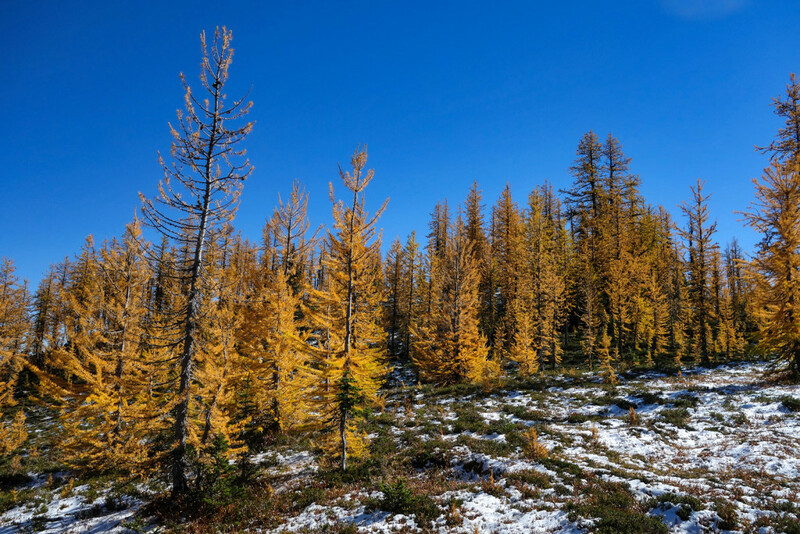 A small group of us decided to check out the golden larches in Manning Park last weekend and went for the summit of Frosty Mountain. 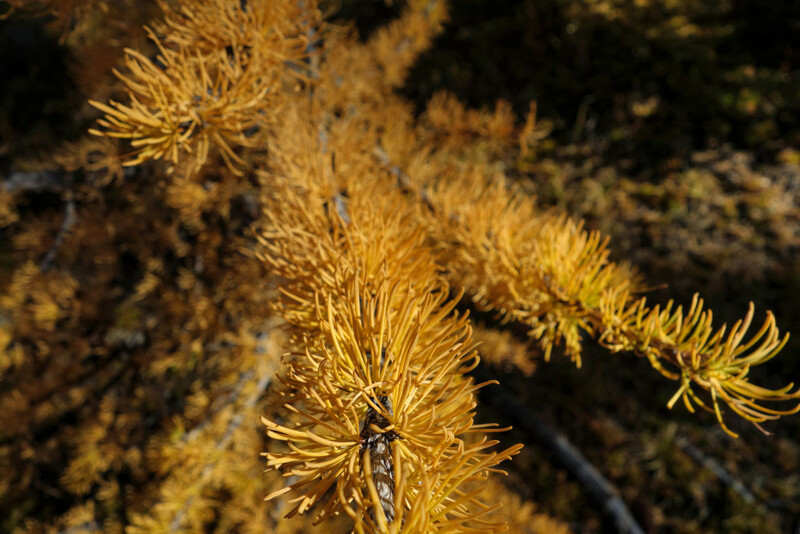 It was my first time exploring the golden larches in the Fall and I was pretty surprised to see dozens and dozens of people in the meadows and at the top. The views were well worth the crowds of people. 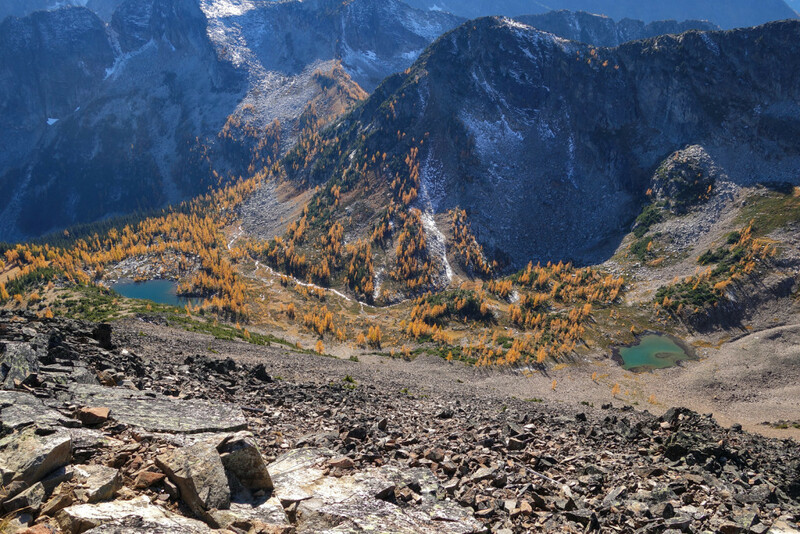 You have the option of starting and/or ending at either Lightning Lakes or Windy Joe via the Similkameen trail. From what I’ve heard, the Lightning Lake ascent is generally more steep than the Windy Joe ascent, but it’s shorter in distance. 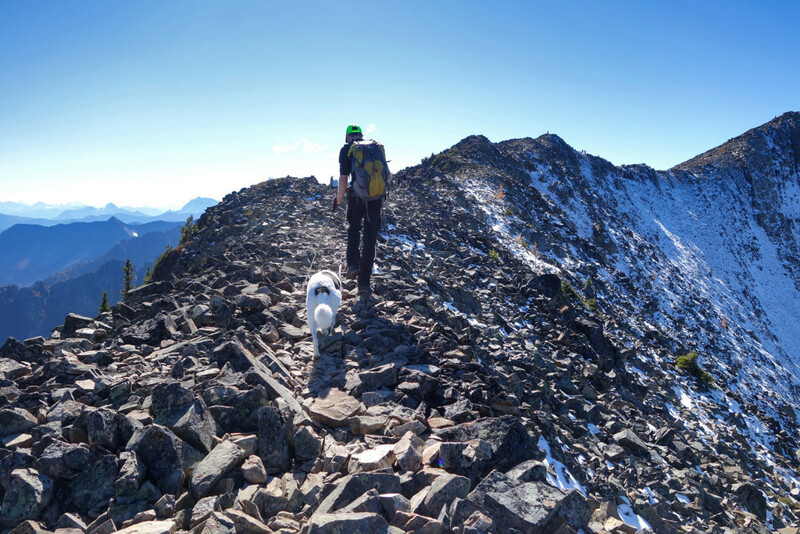 For this trip, we chose to ascend and descend via Lightning Lakes. 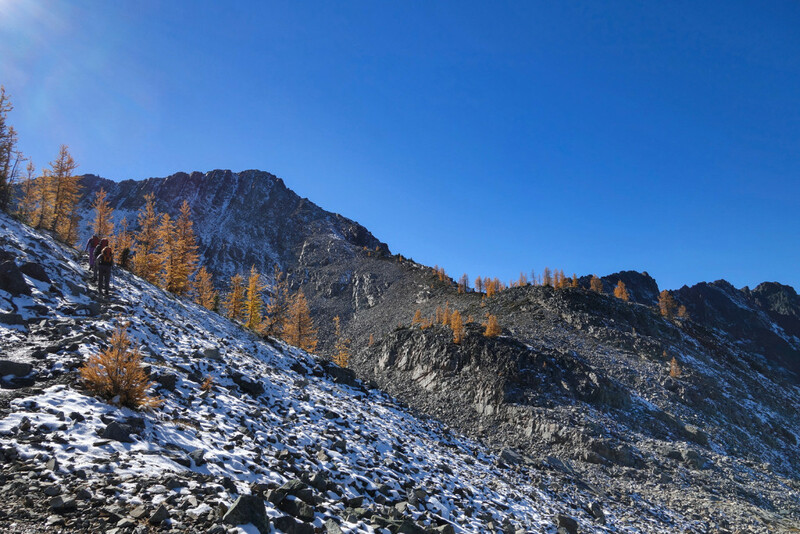 Though, it can be heavily trafficked, Frosty Mountain is one of my favourite hikes in the area simply for the views. 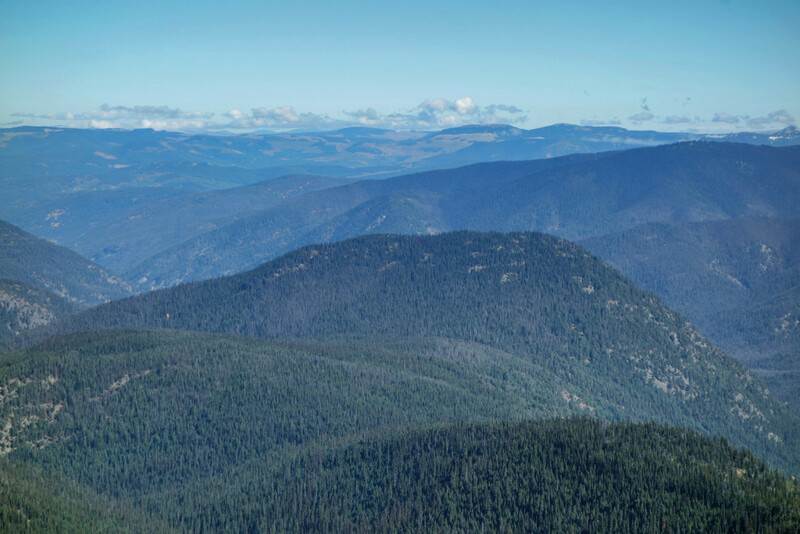 It is the highest peak in Manning Park, sitting at 2408m of elevation. We covered a lot of distance (22.8km round trip), but the elevation gain was fairly gradual, making the hike moderately difficult. I hiked up to the Frosty summit last year during the summer. 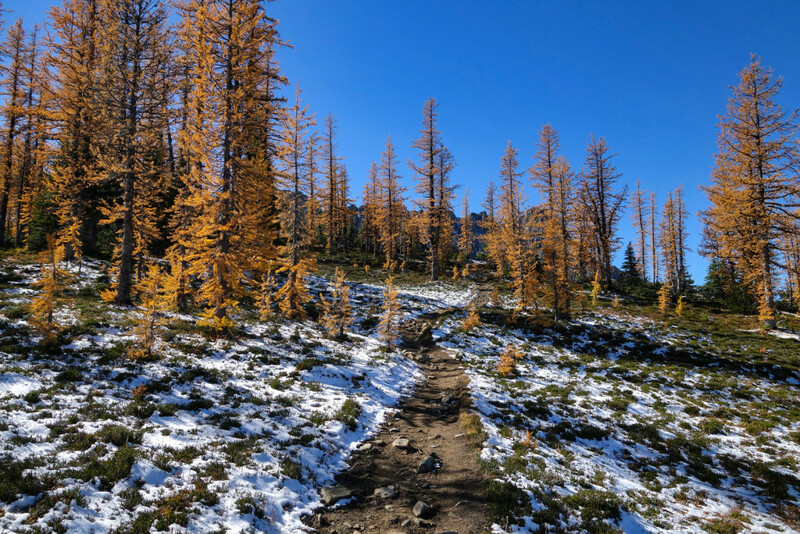 I was stoked to see a different perspective, with the golden larches in all of their glory. Area: E.C. Manning Park, Crowsnest Highway, BC. 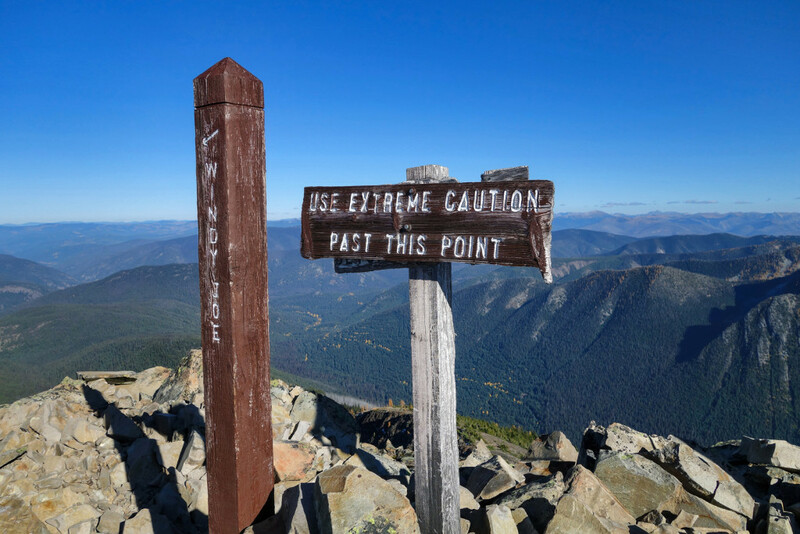 Nearby hikes: Three Brothers via Heather Trail, Frosty Mountain, Windy Joe, Flat Top Mountain and Nicomen Peak. 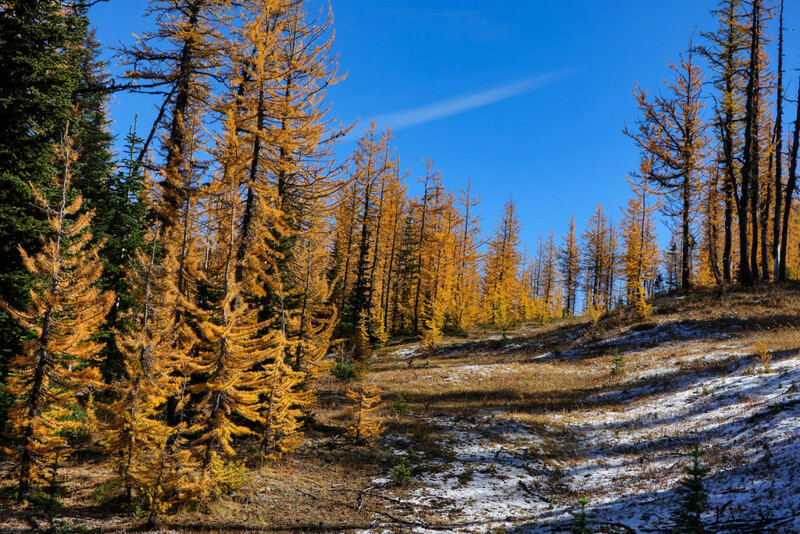 Good to know: Frosty Mountain is known for it’s golden larches. The best time to visit is in late September/early October. 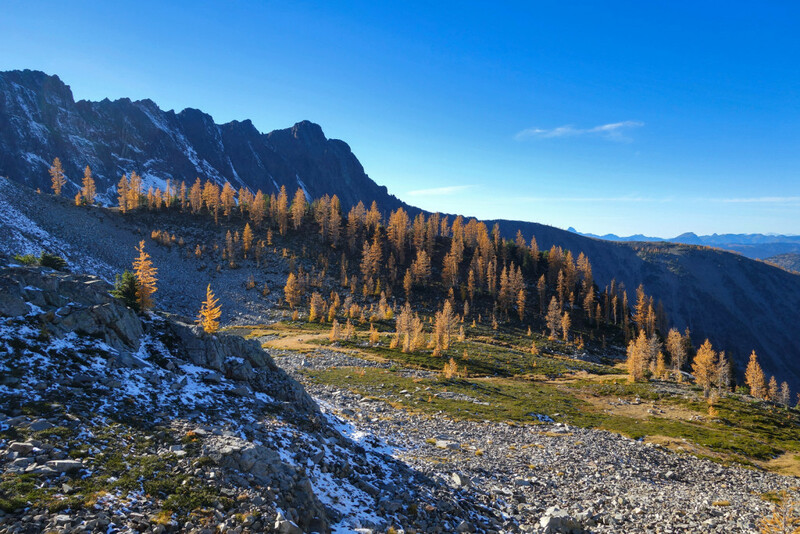 Be prepared for crowds of hikers in this time frame, it’s one of the only commonly known destinations for larch trees. 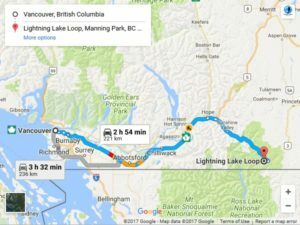 ✓ Continue along the road for 3km, keep left at a fork and you’ll reach the Lightning Lakes day use area. ✓ The trailhead is on the other side of the Lightning Lakes dam. We met our friends at the Lightning Lake day use area on Sunday morning; we packed our gear and headed up ASAP. The trail climbed up the south end of Lightning Lake; it was well groomed and graded all the way up. 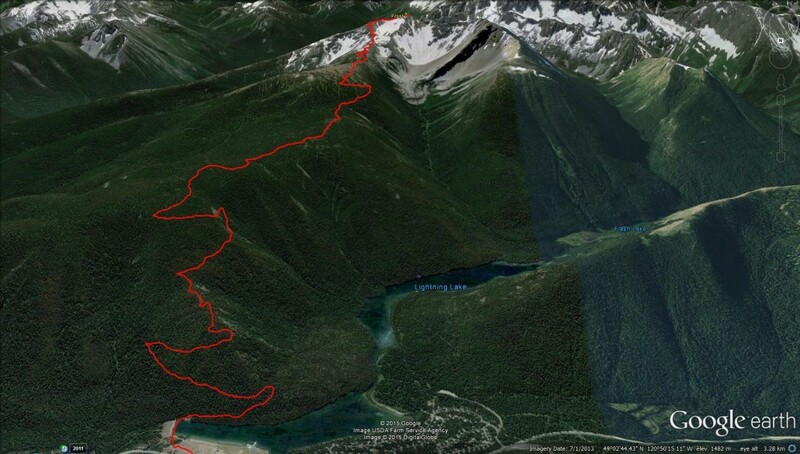 The steepest section, in my opinion, is the climb out of Lightning Lakes – the first three or four switchbacks. 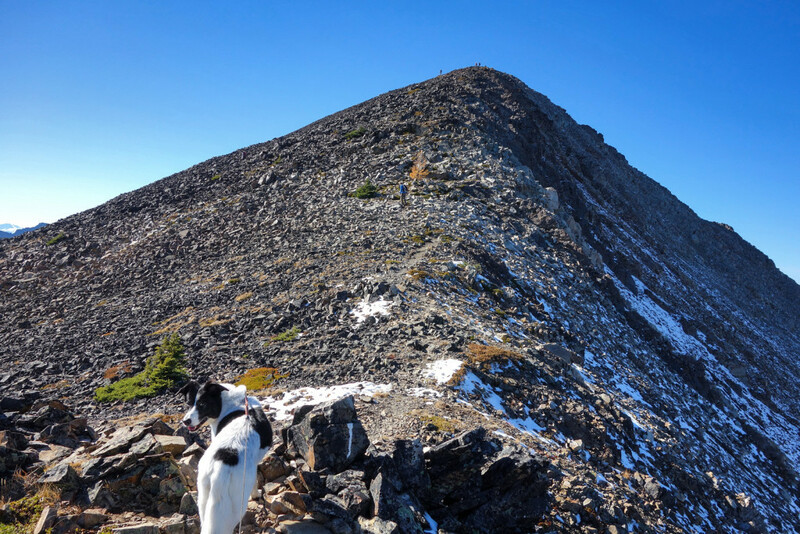 The rest of the trail is less steep, until you reach the scree slope just before Frosty’s summit. Around 2km in, we gained peek-a-boo views of Lightning and Strike lakes below. There were a few spots for views until the 6km marker. 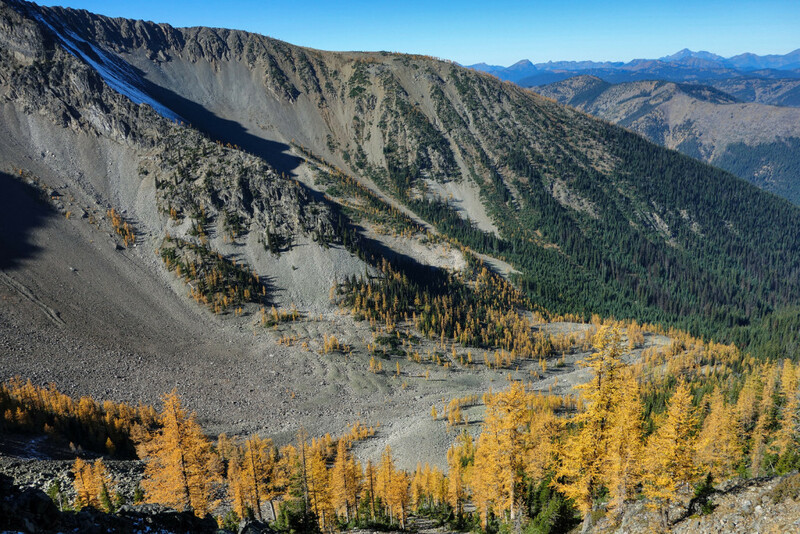 Ryan and I had hiked to the meadows almost a month prior (we were way too early for the larches) when the Fall colours were much more vibrant lower down. By now, a lot of the trees had lost the saturated red and orange leaves. In any case, the views were still beautiful. After the initial switchbacks, the trail reached a plateau on the ridge. From there to the Frosty Creek Camp (a little after 6km from the start), the path was nice and flat. The camp itself has a rustic shelter, an outhouse, a bear cache for your food, and plenty of room for tents. When we arrived, it was full of tenters who had camped the previous day and were in the process of packing up and heading back down. We stopped here for a quick food and water break before continuing on to the final set of switchbacks before the larch meadows. 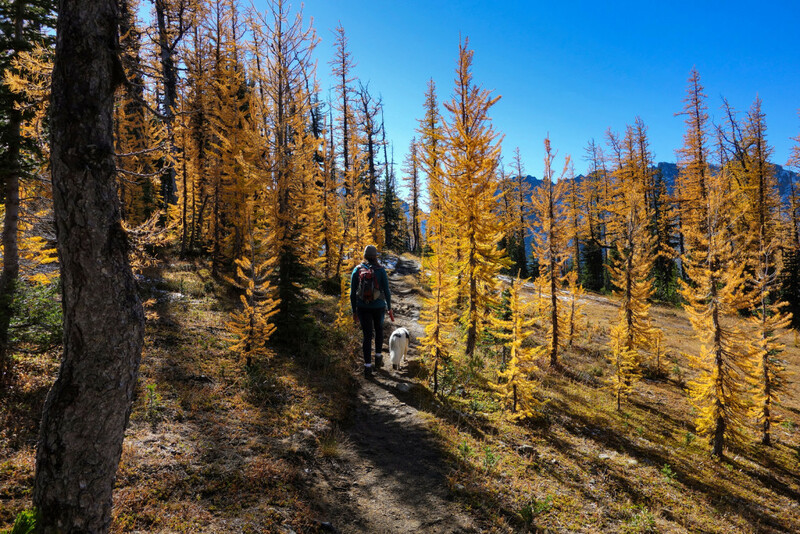 We hit the larches at the perfect time of year; the needles were golden yellow and still in place on the trees. 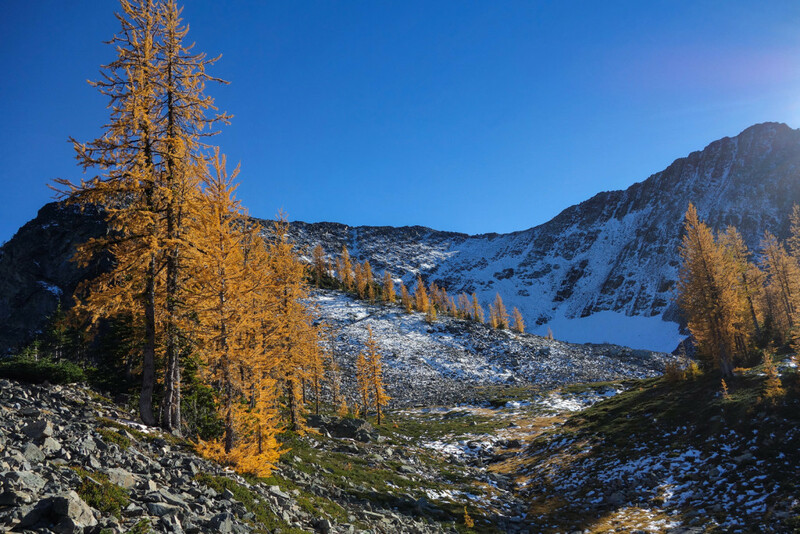 With the blue sky contrasted against the rich coloured larches, the view was spectacular. It’s fascinating to think some of these trees are over a thousand years old. The trail continued through the meadows before ending at the base of Frosty Mountain. We stopped for a quick break before the final kick. Not entirely sure, but I believe Skeena was feeling the altitude at this point. 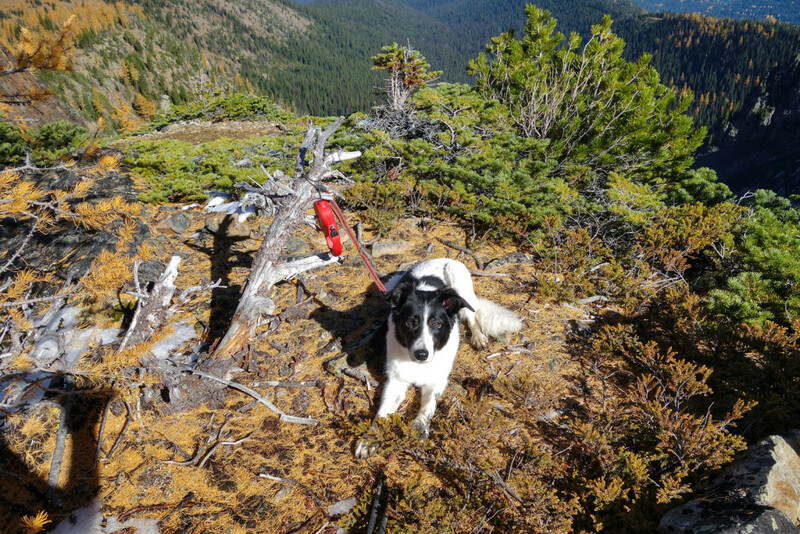 We kept her fed and hydrated throughout the day, but she was getting more and more tired as we neared the top. With the sun beating down on us, I splashed Skeena with water (her face, paws, and her stomach) to keep her cool. We reached the bottom of the scree slope, which gained the eastern ridge of Frosty. There is a trail bed etched into the scree slope and you can follow the occasional cairns to the top of the ridge. 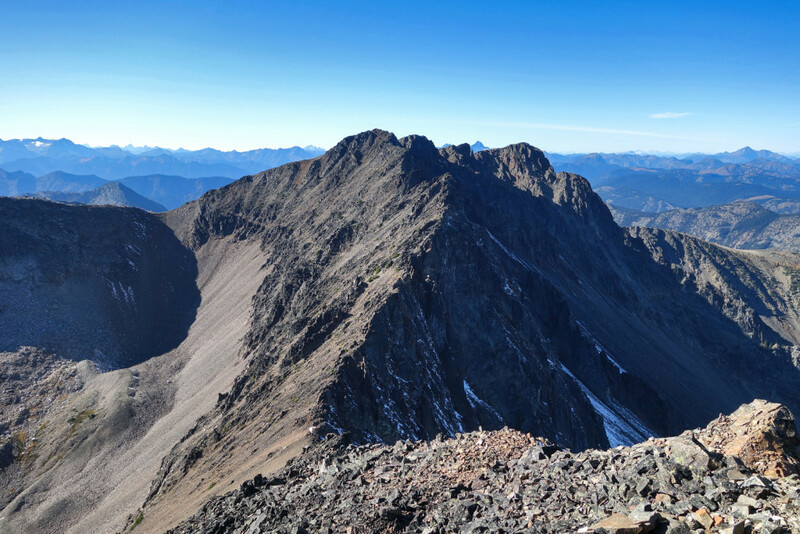 We had a good vantage point and we saw a long line of people snaking up and down the scree, along the ridge, and on the summit. 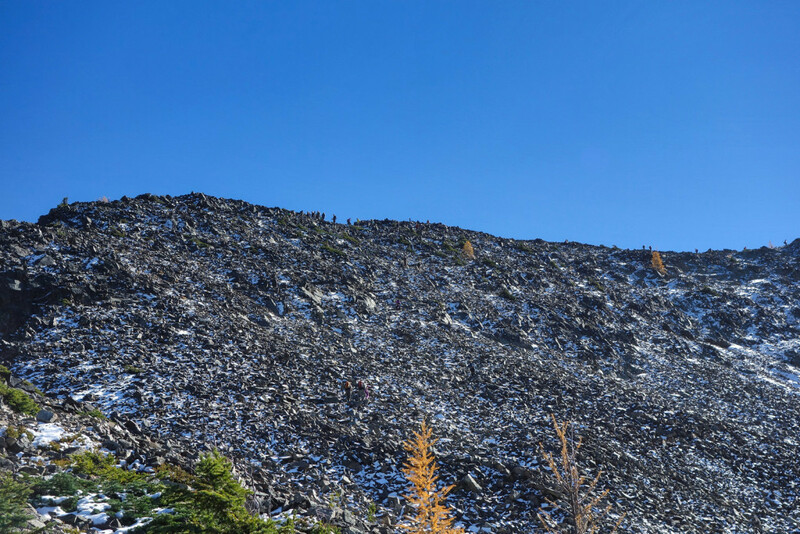 The scree itself did not take very long to climb, even with us stopping frequently for short breaks and photos. 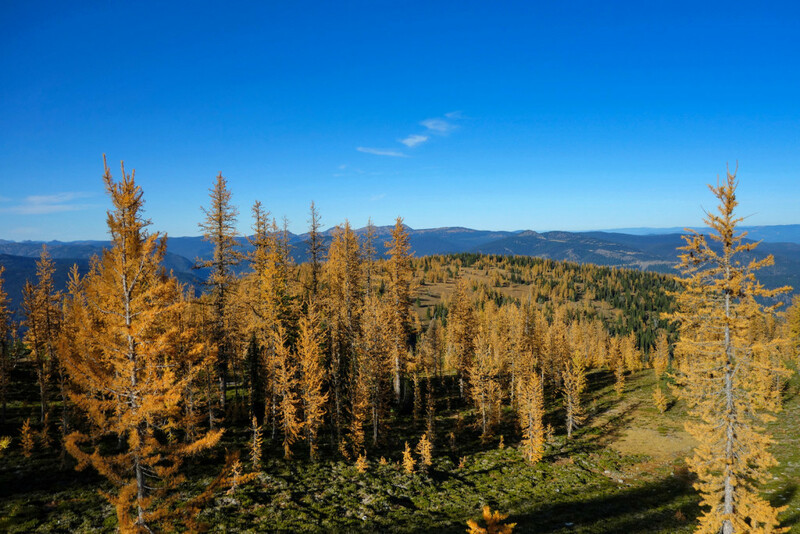 As we topped out on the ridge, views of the Manning Park and the north Cascades opened up almost drastically. 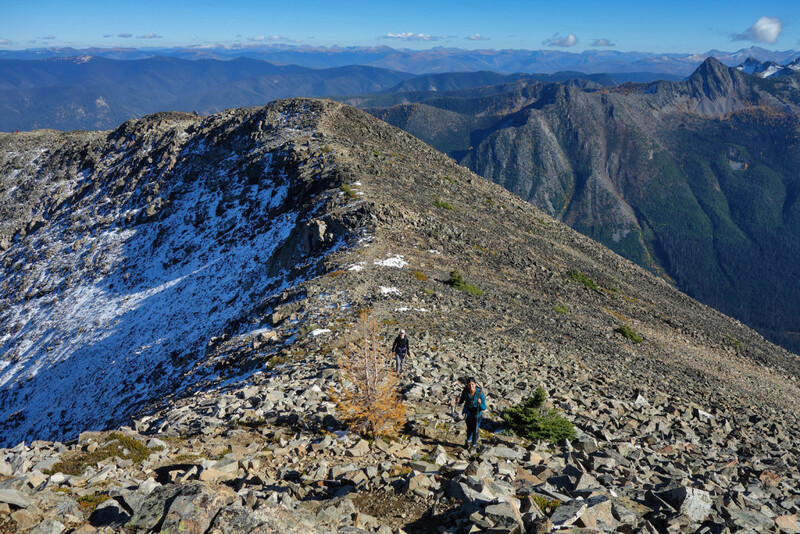 At the top of the scree slope, we intersected the Windy Joe trail junction and continued along the ridge crest to the summit. The summit was crowded with people, but we found a place to sit down and take in the views. 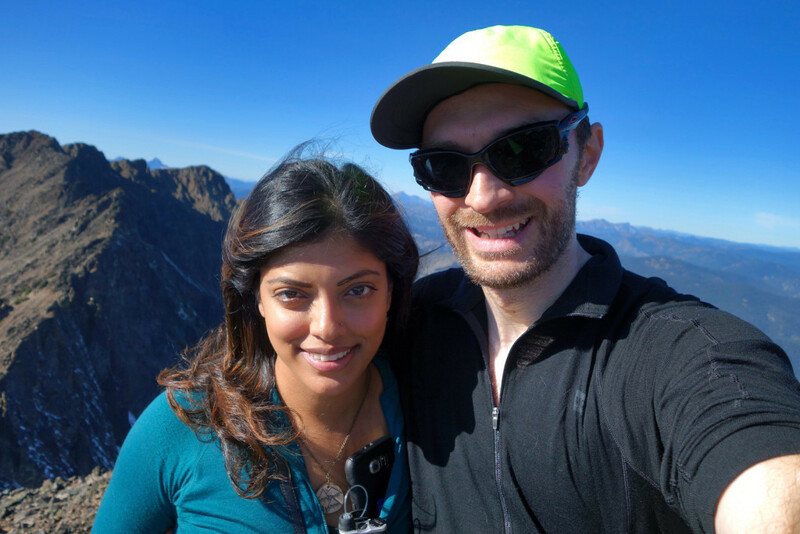 This was Skeena’s first summit. All day we kept hearing “What a beautiful puppy!” This girl is 10 years old and going strong! 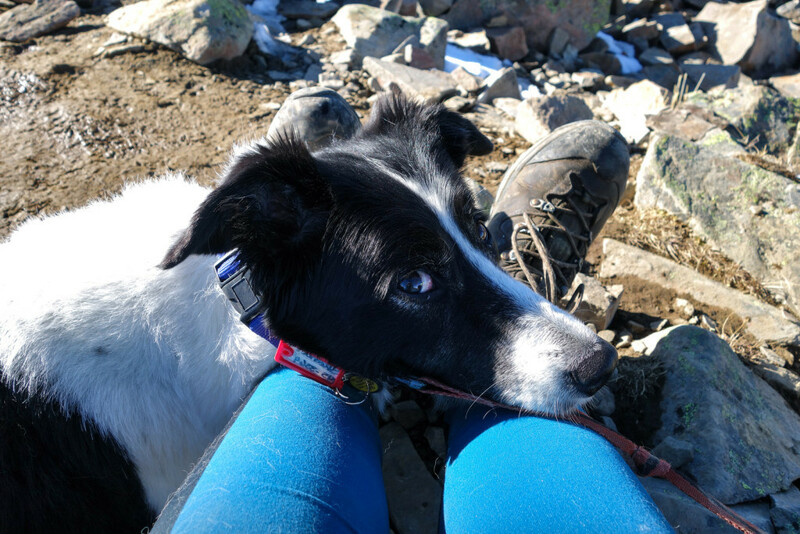 She was tired from the climb up and took a short nap as we snapped some pictures and fueled up for the trip down. Our descent was uneventful. We ran into a handful of people starting their ascent on the scree slope while we were racing back to the car before sunset. We stopped for a few more pics through the meadows; for the most part, we put our heads down and powered along to get back to the car. I’m very proud of how well Skeena handled the day trip, she didn’t whine or complain once. She napped and lazed around most of the next day, but every time I tell her we’re going for a hike, she’s downstairs and waiting at the front door. With good views and great company, we had a successful day. 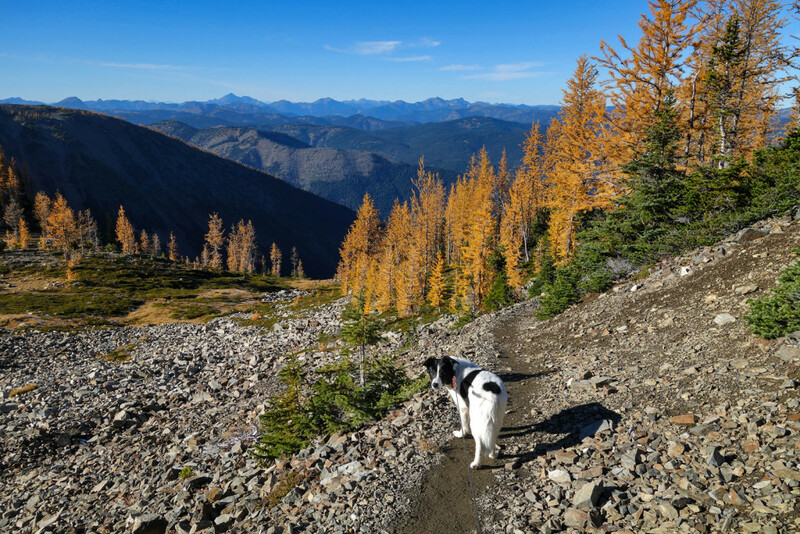 The views were amazing enough for us to plan an annual golden larches trip to Frosty. As usual, I reduced my basal to 50% for the hike and aimed to keep my blood sugars in the 8-12mmol range. Thanks to my new Animas Vibe and Dexcom CGM unit, I was able to catch a low (3.8 mmol) during the switchbacks while climbing out of Lightning Lake and nip it with a pack of Shotbloks. Apart from that, my blood sugars were nice and stable throughout the day and the initial low didn’t cause any trouble later on. I packed my usual 3L of water and about 3-4 days worth of sweets and snacks. 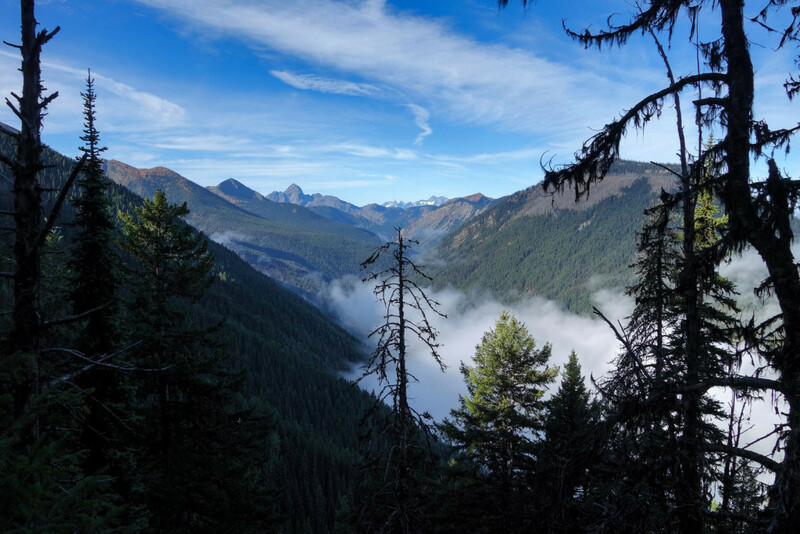 “As a core leisure activity, there are certain aspects of hiking that I really admire because they remain constant or predictable. For example, 30 minutes prior to hiking Frosty Mountain I used the Temp Basal function to decrease my basal rate by 30% and I set it for 4 hours. At the end of that 4 hours, I reset it and decreased the normal rate by 50% for another 4 hours. Since I had never done Frosty Mountain and I found conflicting reports online, I decided this hike would be a perfect opportunity to experiment with a new drinking mix. I added 450 ml of Minute Maid Cranberry Cocktail, 450 ml of Pink Grapefruit drink, and 591 ml of Galceau Vitamin Water to filtered water in my 3 L hydration pack. I choose these three drinks because of the vast array of high ratios of vitamins and minerals vital to preventing muscle cramps and other organ issues when muscles are extremely taxed and organs vent toxins. I also packed a 1.5 L bottle of filtered water with 2 fresh lemons squeezed into it for the descent. Fortunately, I use the Animas Vibe and the CGM feature is stunning. I have my pump alarm for lows set to 6 mmol and the alarm for a high set to 8.5 mmol. In total, the lowest my sugar level dipped to was 4.2 mmol and the highest reading was 10.3 mmol during the hike. I always take full advantage of the cool predictive arrows on the Vibe CGM screen, and I drank from my hydropack accordingly to correct downward trends. As such, my average sugar level for this particular hike was 8.7 mmol. Nice set of photos. 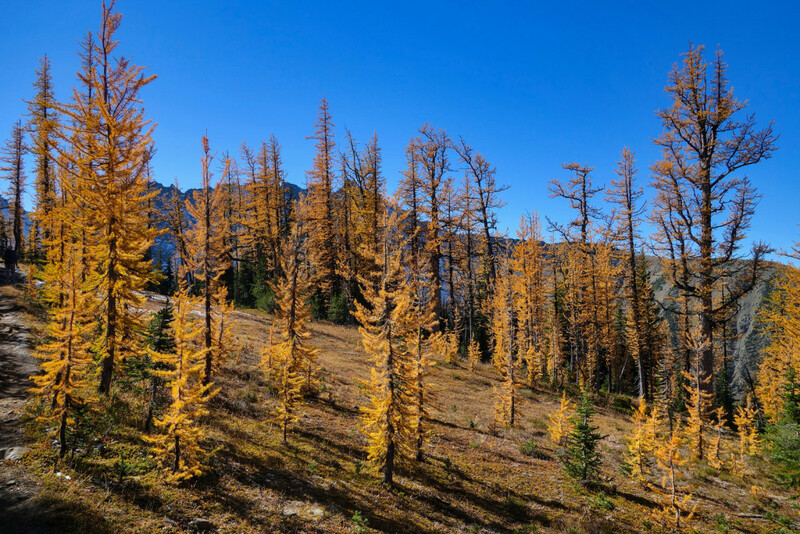 The larches sure look spectacular…something which I’ve never had the opportunity to see. Mt. Frosty was where I did my first backpacking trip in the 1970’s and there was only a few people around. How times change. Good to see that your new pump device is working for you. Hi Ron, thanks for the note :).